How can we know that anything is ‘true’? Can we trust our senses? Explain that some people, wisely perhaps, will not believe anything unless they see it for themselves. What happens though, when you can’t trust what you see? Show students the optical illusion, left. 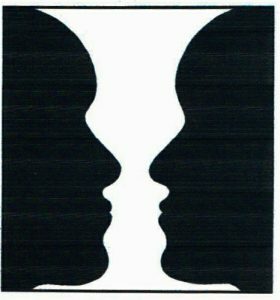 What do they see: two faces or a vase? Explain that they may have seen such illusions before, but have they realised the point? Explain that such illusions demonstrate that what we see is interpreted by us. We look for things that we recognise and this is why we are so easy to fool. Magicians on the TV know that the hand can move quicker that the eye and are able to create illusions that seem impossible. describe to the person next to them, an illusion or magic trick they have seen or heard of. say how do they think the trick was done, or how the brain was fooled. 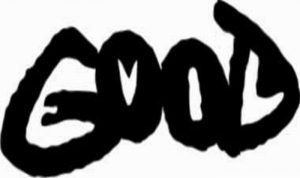 What do they see first, ‘GOOD’ or ‘EVIL’? What do such illusions as these make you feel about the world around you? Is the world better or worse than it sometimes appears? 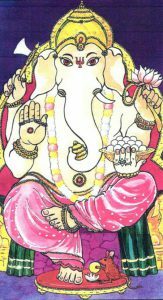 Point out that many religions and philosophies say that everything we experience is a kind of illusion, or at least, falls short of what is ultimately ‘real’. share ideas with the whole group. mouse / rat = the importance of all creatures, whatever their size (or a symbol of obstacles to be overcome). Ask students for ideas on where people ‘rush to judgement’ on first impressions that later turn out to be wrong.